Are you looking for boat storage in Lago Vista, Texas? Come to Waterford Marina today! We have 80 covered boat slips ranging from 28’ to 36’ in length. No matter how large or small your boat, we have a spot for you right on the shore of Lake Travis! You’ll enjoy our convenient location as well as our many amenities to make your experience with us the best in the area. From a fire suppression system to secured gate entry, we do everything in our power to ensure a satisfactory marina experience. We also employ security surveillance cameras, with professional boat cleaning services available to prevent damage or decay. We even have insect and spider control! If that isn’t enough, ask our manager about our pump-out station and onsite electricity. We’re on the north shore of Lake Travis on Westwater Court. This central location is perfect for boaters from all over the Lake Travis area. Whether you live in Point Venture, Jonestwon, or Volente, our facility is a quick drive away. Call today to reserve the boat slip that you’ve been looking for! 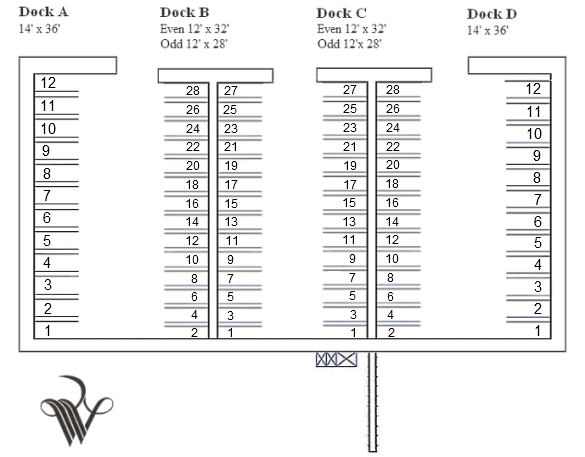 *Please note the odd numbered slips on Dock B and C are 28'.